Making the maps you can download from this site and keeping them updated takes a lot of time and dedication. 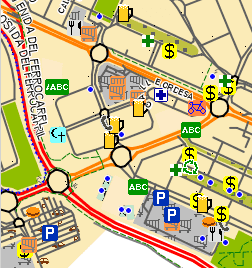 I also spend a great effort completing and fixing OpenSetreetMap data, to make the map better each day. Downloads are free, but I think it's fair to give something back, so I ask you to donate now. If you want to give your support to help maintaining and improving this service, you can donate any monetary amount. I will thank you even if it is small. Bank Transfer to the account IBAN ES53 0182.9465.61.0201062218 of BBVA bank (BIC BBVAESMMXXX). Please do not send transers from outside Europe, use PayPal instead. Voy a Escocia dentro de un mes, estarÃ© encantado de hacerte una mÃ¡s que merecida donaciÃ³n a la vuelta del viaje. Keep up the good OS work! !